For a while now we had the plan to build a dynamometer out of two Siemens made Ford Ranger AC motors. While no calibrated results could be made (through measuring the torque directly) the contraption would be very useful for comparative analysis of motor control regimes and settings. The first steps (October last year) involved working out how to couple the two together. The motor shaft is hollow to allow a further shaft to run directly through the motor. The output end of the shaft has a helical gear directly machined into it, for a now unavailable planetary gear set. Others have suggested directly welding to the shaft, some have success using taper-lock devices directly on the gear. In our situation, because of its non-critical nature (a failure is not likely to put anyone in a compromised situation), we decided to go with another untested route – developing a bush that works somewhat like an inside out double ended collet holder. Made of brass it may not be as strong as the rest of the equipment, but simple to make on the lathe, and not likely to damage the motors for future applications. 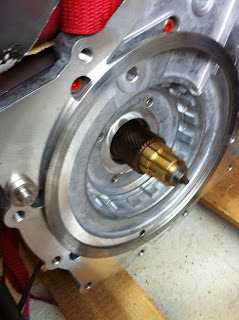 As previously mentioned Stephen designed and organised an adaptor plate for bolting the motors together. 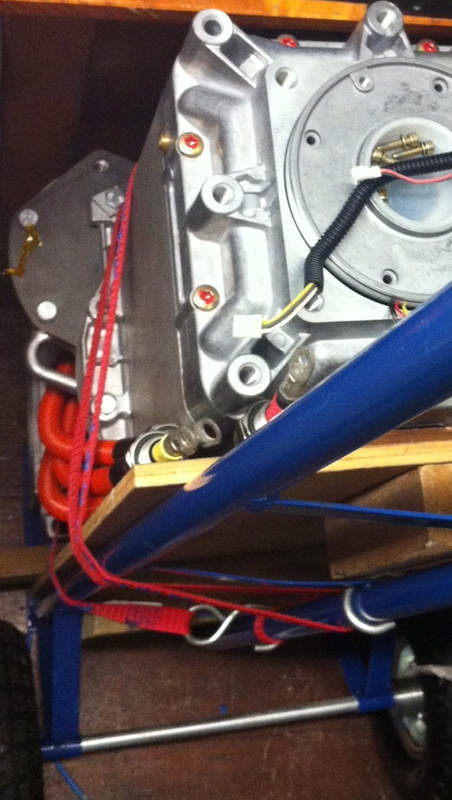 The motors are now coupled, and spinning just about as freely as individually so must be fairly close to aligned. Due to the weight of the combined motors (over 130kg) we wanted to be able to wheel them around. We started to think about building a trolley but instead opted for far cheaper and easier option - a 200kg rated handcart. Next came the job of hooking up the motor encoder and temperature sensors. Reportedly there isn't a plug available for the encoder connector on the motor, so a new arrangement is required. We made a stainless piece that reduces the hole to suit the M23 servo-motor style encoder connector used on standard Siemens motors. I don't think that the plastic connectors that the motors are delivered with were originally part of the plan. 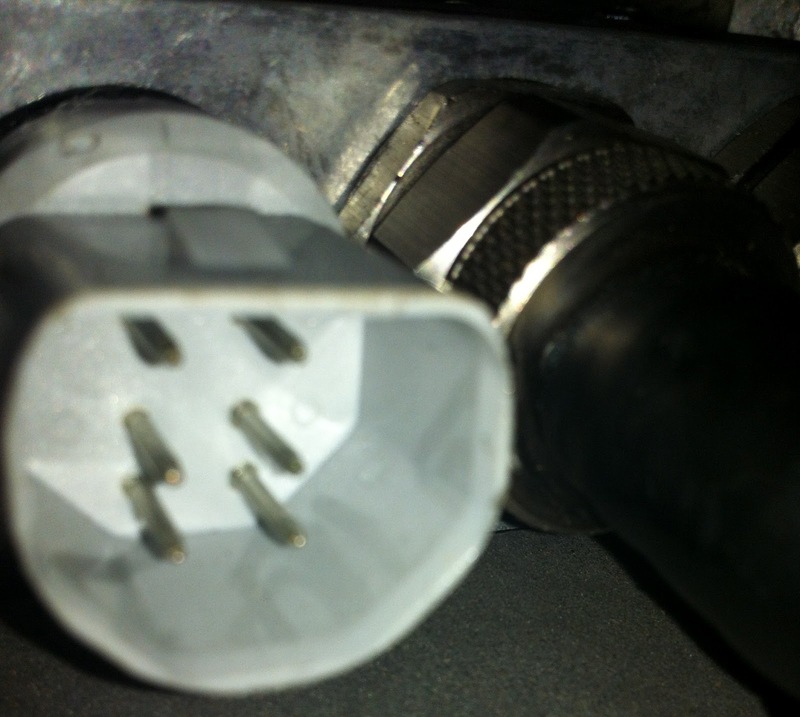 The tapped hole for the closest cover bolt breaks through into the hole for the connector. Worse still, an o-ring seal sits beyond where the bolt hole breaks through, which means the o-ring is damaged every time the fitting is removed or put back in. Not a clever design, but we will run with it for the mean time.